The Pearls' Teachings | Why Not Train A Child? When I find Pro-Spankers speaking out against the Pearl’s teachings, I like to highlight them because I am very aware that those who are convinced that the Bible teaches that they must spank will not listen to the arguments of those who do not. If you know someone who is looking into the Pearls’ teachings and you want to convince them how dangerous these teachings are, please show them the 2 videos below. Zsuzsanna Anderson is an independent fundamental Baptist and she is clearly appalled by Michael Pearl and his teachings. Zsuzsanna does not believe in attachment parenting, in fact, on her blog she derides it. You can easily confirm that by checking out the posts about Discipline on her blog. Tulip Girl has an important post which I must share with you on this 8th anniversary of Lydia’s death. 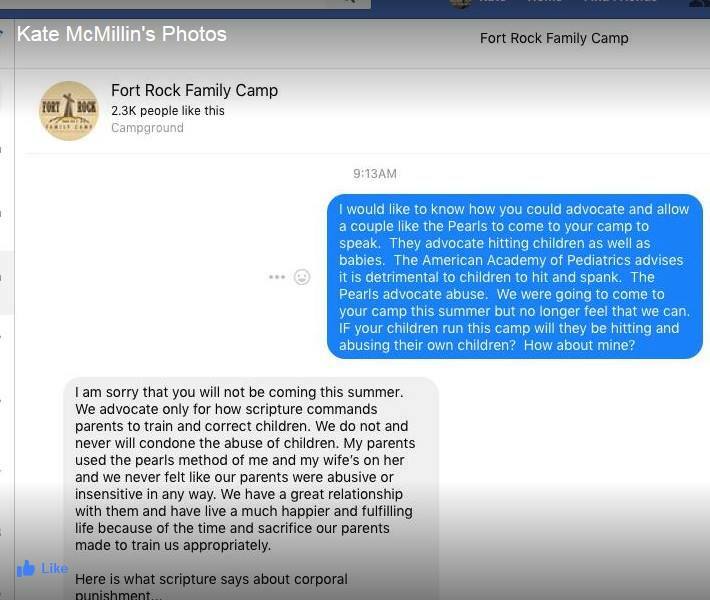 And at one time, people were asking me for proof that the Duggars used the Pearl methods and/or spanked at all. Here is proof. Coleen G. was nice enough to share her testimony here on my blog. I’m reposting it below so it won’t be missed. I have seen the fruits of the Pearl’s methods in my own children and at another family that we know. My friend tried to switch her toddler son until he was crying submissively and brokenly. She was horrified at how many times this needed to be done and each event required welting, bruises because he would not be broken until he no longer could stand the agony. She never switched like that again and never used their methods again. She had been following the techniques as described including the correct “tool”. I too tried to follow their methods but I could not bring myself to hit that hard. I did not know of my friend’s sessions with her son at the time. That story came out to me years later. I have a temper problem and very strong willed children as well(I know now that is a blessing not a sin issue). While I tried very hard to not let my temper rule me it came out when I had to go through multiple sessions over many days about the same issues with the same child. Their “rebellion” was taken personally and fed my sinful anger problem. I was not seeing results with my young children they mostly just grew out of whatever development stage and corresponding behaviors that I had been taught vis the Pearl’s was disobedience. God got a hold of me healing the sin-anger and showing me that my parenting methods were causing me to sin against my children even when I was not angry. The switch was chaotic and it took almost two years for relational healing. Yes I was/am a sinner who had a problem but the Pearl’s methods aggravated and intensified that sin issue compounding the damage I was doing. Yes I had the book, all the connected books. I had videos and the magazine subscription so I was well steeped in their methodology. Having now stepped away from it all and truly studied both the bible and child development I can see that much of what they teach is toxic even for mild even tempered parent of equally tempered children. While bible-y in terminology it is not Christ-like and denies what is normal development as sin that must be punished out of a child for the convenience of the parents and the child’s future salvation. I have lived with the fruit and it is a sour hellish thing fit only for those who like the Pharisees care more for control and rules than Love and sacrificial living towards the weaker. Is the child-training method of homeschool business No Greater Joy Ministries a factor in child deaths? Sean Paddock (2006) and Lydia Schatz (2010) both died at the hands of parents who allegedly followed Michael Pearl’s child training method. But what influence, if any, might Pearl’s teachings have had on the parents’ thinking? In the wake of intense online debate and controversy in 2010, this project undertook an in-depth review of No Greater Joy Ministries’ doctrinal ideas. It was assembled with the assistance of a 10-member review team who provided theological and editorial guidance for the project. The e-book is 76 pages, and is available as a free download for the information of the Christian homeschooling community and other interested parties. Creative Commons License: Parenting in the Name of God by David J. Dyck and C.L. Dyck is licensed under a Creative Commons Attribution-NonCommercial-NoDerivs 3.0 Unported License. To download, please click here. Baucham’s system thus ends up being more authoritarian than Pearl’s, and that is caused by the fact that Baucham not only believes in original sin (as does Pearl), but also total depravity. How Baucham applies his belief in the latter (total depravity) makes Pearl’s child training system appear gentle and weak in comparison. While long, it is well worth reading all the way through to the conclusion. So, You Think Spanking Is OK Because You Turned Out Fine? Samuel Martin has a new blog post entitled, “So you think corporal punishment/spanking/smacking is ok because you turned out fine: Think again”. To Condition Up A Child? Michael Pearl says that his teachings are Biblical. Lee Woofenden does not agree and he explains why in his post, To Train Up A Child, or: Spare the Rod? What Rod? This is a long article and worth the read. He points out, among other things, that Mr. Pearl is actually teaching parents to condition their children which is not Biblical. Sarah at Field of Vision has started a small series of posts looking at the Pearl’s teachings and specifically their attitude towards children. This series focuses on one particular article by Michael Pearl called, Emotional Manipulators. Part 1: Parenting and the Power of Perspective in which she discusses how Michael Pearl assigns negative intent to a 4 year old child and her mother. Part 2: Michael Pearl and Responding to Attention Seekers in which she discusses Michael Pearl’s diagnosis of the child and his very harsh proposed remedy. She may post more of this series in the future, in which case I will add them to this post. Forgedimagination explains exactly how the Pearls’ teachings turn loving parents into monsters in Raised To Be A Monster. Back in March of 2012, Jan Heimlich debated Michael Pearl in a video which was featured in The Christian Post. Although, I did mention the debate at the time as well as Samuel Martin’s Rebuttal to one of his statements, I never gave my own rebuttal. I would like to respond to some of Mr. Pearl’s statements. Rather than transcribe his comments myself, I will use the quotes given in the Christian Post article. … In our book, To Train up a Child, we clearly point out that parents should not spank when it doesn’t work; they should not spank when they’re angry. We point out that they should spank five or ten licks, no more. And we point out that the spanking should be in accordance to the size of the child. We point out they should never leave marks. Those who are MOSTLY consistent must use the switch too often. Those who are ALWAYS consistent come to almost never need the switch. Whatcom Mom had an interesting comment which I would like to highlight. I’m hoping the readers here will have some ideas about improving adoption home study practice, based on what we have learned from the deaths of Hana Williams and Lydia Schatz and injuries to their siblings. So you know where I’m coming from. I’m an adoptive parent of now adult daughters, one adopted as an infant from a local nonprofit agency, the other as a toddler through state foster care. I’ve been active in pre-adoptive education and post-adoption support and have had plenty of occasion to reflect on issues that arise in transracial, special needs, and international and open adoptions. I have long been concerned about adoption agencies that place especially needy and difficult children with naïve, unprepared (and maybe overconfident) families and then fail to follow up with oversight and support. As I reflect with sorrow and horror at the tragedy which was the Williams Trial, I find myself trying to make sense of what happened and why. What I see as the root problem is pride. The Bible says that God hates pride. We know that “pride goeth before a fall and a haughty spirit before destruction” (Proverbs 16:18). I believe that very few people would argue with me when I say that Carri Williams had a problem with pride. I heard her described as a person who had to be always right. She was said to have perfect children. People described her as intimidating because her children were so perfect. I was told that when someone disagreed with her, they had a hard time confronting her because she had a reputation for a very cutting tongue. So, when people had concerns about how she was raising her children, they just withdrew away from her and left her alone. What else could they do? She would not listen, and she certainly would not accept help. The Wartburg Watch, takes another look at the Pearls’ teachings and The Senseless Death of Hana Williams. They link to all their previous posts and explain their problems with the teachings. Also, Maureen has a post about Hana’s Legacy. Awaiting the Verdicts in the Williams Trial: Another Michael Pearl/To Train Up A Child Associated Death. She also gives a brief outline of Pearl and his teachings and a lamentation for the devastation they have caused both to Christian families as well as to the lost who observe and turn away in disgust. Today I would like to reflect on why we are following this trial. It is because the Williams were Pearl Followers. Their 7 biological children were all raised by the Pearl method and Carri was very happy and confident in this method being the best for everyone. I know this from reading on the Remembrance of Hana Williams Facebook Group and from private messages from people who knew the Williams. I have been told that she would recommend To Train Up A Child, by Michael Pearl to everyone, even going so far as to give people the book. Some have told me that they read the book and threw it away in disgust. But they were intimidated by how confident she was and how perfect her children appeared and so most did nothing. Someone did try to confront her about the abuse and was harshly scolded. This is why this trial is so interesting to me. When they adopted the children, they apparently expected them to also conform to the teachings and when they did not, they went WAY outside of what the Pearls teach. I do not want to imply that they were following the Pearls’ teachings in regards to the adopted children. The only thing they were following was the spirit of always winning, always being consistent and ever admitting defeat. For more on that, please see my post, “Why Blame The Pearls At All?”. I also read in the same Facebook group that the girls used to always dress like “Little House On The Prairie” but wore jeans to court when they testified. This speaks volumes to me. It took a lot of guts to defy their parents in that way. They had to know that would upset and displease them. Changing from a lifetime of all dresses to pants is a big step and can take years. In a formal setting like court, they would not stand out for wearing dresses. This makes me suspect that they have lost respect for their parents and their teachings. Of course, it is also possible that the defense attorneys asked them to wear pants to show the court how normal they are and that they were not damaged by their upbringing. I have no way of knowing, but I doubt that the Williams approved. The Skagit Valley Herald reports that a Forensic Dentist testified as to Hana’s likely age today and the best he could do was that she was somewhere between 13 and 18 years of age. He testified that she was probably at least 15 but would not be surprised if he were to find out that she was 13. Hana’s biological cousin also testified today and I already know from his posts in the Facebook Group that she is 13. If the jury believes the forensic dentist over the cousin, the Williams will be charged with Manslaughter By Domestic Violence instead of Homicide By Abuse. Here is the story with video from KiroTV. They say that even if the jury were to throw out the charge of Homicide By Abuse, they could still spend decades in jail for manslaughter and assault. Please note that Maureen has posted part 2 of her case study. Michael Pearl’s teachings are being discussed in the blogosphere again. Rick Morton responds to Jonathan Merritt’s Analysis of Michael & Debi Pearl’s “Child Training” & The “Adoption Fever” Dialogue in this post. Morgan Guyton discusses Why He Would Fail Michael And Debi Pearl’s Parenting Class. Sylvia shares her testimony and Her Thoughts On Spanking in this post. Filed Under Anti Spanking Links, Testimonies Tagged With Anti Spanking Links, Hebrew, instincts, New Testament, Proverbs, rod, scepter, testimony, The Pearls' Teachings, Would Jesus Spank? Parallels Between Training Children and Training Dogs? Dara Stoltzfus has 2 recent posts of interest. In Michael Pearl is right about training kids like dogs! she discusses pain and it’s usefulness in training children and dogs. In Crying over a Spanish Soap Opera!!! she discusses how raising children by learned traditions instead of by science and truth can damage them. Recovering Grace promotes Tim Challies’ review of Created To Be His Help Meet. Also, someone brings up his review of To Train Up A Child in the comments and discussion of the Pearls ensues which might be of interest to my readers. Tim Challies Review of To Train Up A Child Part 1 in which he looks at training versus discipline, and his concerns with Pearl’s training. Tim Challies Review of To Train Up A Child Part 2 in which he looks at the innocent child, the redemptive rod, and gives his conclusion. Home Educating Family Magazine has published an opinion piece about the Duggars and the teachings they follow (Gothard, S. M. Davis and Pearl) called, They Smile, but Do They Laugh? Hi! We would like to inform you that the publishing of a book “To train up a child” (and one more) has been withdrawn Poland (by the publisher). There are some other books like that (Fugate, Dobson, Smalley, Barnes) in Poland, but we hope that they will be withdrawn too. This story is from February 2012, but I had not heard about it so I very much appreciate them sharing the news with us. Here is the news story they linked for me and here is an English translation of it. Of course, the translation is done by computer program, so it is not perfect, but gives us the idea. This is very good news! The Polish Anti Spanking community has been working hard and have convinced a publisher to remove two books from circulation! ( the other book is Discipline Them, Love Them by Betty Chase.) I wish that could happen here, but To Train Up A Child in English is self-published by the Pearls. We are trying to get as many book sellers as possible to stop selling it. We have convinced quite a few and are still working on Amazon.com. Is This Good Christian Parenting? Ruvin, who blogs at By The Hui, has grave concerns about the Pearls’ teachings. She explains why in This is Christian Parenting? Samuel Martin has posted a rebuttal to a quote Pearl made during his debate with Janet Heimlich in The Christian Post. The Christian Post reports on and shows the video of the debate about Biblical Chastisement between Michael Pearl and Janet Heimlich. Be sure to read Teri’s rebuttal to Pearl in the comments below. Speaking of debates, when Christian Today took their stand against spanking, they were criticized by Author and theologian Denny Burk. Southern Methodist University (SMU) in Dallas has uploaded a video from FOX News in which “SMU Psychology Professor George Holden, who specializes in child-parent relationships and positive child rearing, talks critically about Michael and Debi Pearl’s book “To Train Up A Child,” which advocates spanking.” More information about Professor Holden here. The reason I find this quote so interesting is that the bolded reminds me so much of the Williams Tragedy. For more posts about the Williams see here. Lauren Hensley, Investigative Reporter for CBS TV Station WVNS West Virginia, brings us Spare the Rod Part 1: Spanking in the Name of the Lord in which she interviews Mr. Pearl. In Spare the Rod Part 2: Local Pastors Challenge Biblical Backing she interviews local religious leaders about his teachings. Stay tuned for Part 3: The Effects of Corporal Punishment On A Child (tomorrow?). Jill Monier, of FOX TV in Memphis Tennessee, brings us Spare the Rod, Spoil the Child? which is an in depth look at their book, To Train Up A Child. It includes some pretty disturbing quotes. As well as interviewing the Pearls, they interviewed Barbara King, the executive director of the Exchange Club in Memphis which offers a variety of programs to help Memphis area families breaking the cycle of abuse, and Elizabeth Stewart an adult niece who was also switched by the Pearls. Tom Haynes, of My Fox Atlanta, brings us almost the same story in Investigators Link Book to Deaths of 3 Children. Also, yesterday, Michael Pearl was on Dr. Drew’s show. Here is an Inside Look at that episode. Note that at the very end, Dr. Drew claims that he is still tender in the spot where Mr. Pearl spanked him.